SARCO Architects is a boutique Costa Rica architecture firm. We provide high-end design services exclusively for international clients who want to build a custom luxury vacation home or multi-family investment development in the tropics. Although based in San José, Costa Rica, we design custom, sustainable, modern homes and multi-unit development properties to be built anywhere in the country. We also provide design services for projects in Panama and the Caribbean. Most frequently, our clients choose to build in highly desirable coastal areas. Framed by two oceans, Costa Rica is rich in natural wonders. Lush jungles, breathtaking beaches, amazing wildlife and magnificent sunsets make it the ultimate getaway destination. Our familiarity with tropical climates and terrain enables us to design environmentally responsible projects that blend beautifully with their surroundings. SARCO Architects was founded in 1972 by Heubert Anderson. In 1995, upon the passing of Heubert, his son, Roderick Anderson, assumed the helm of the company and today continues to operate SARCO along with his wife, who is also an architect. Although we lean toward modern, tropical design, SARCO Architects doesn’t have a signature style. We made a conscious decision to not be associated with one particular type of architecture. Instead, we adjust our approach so every home is a true reflection of its owner’s vision. We incorporate local, natural materials in a clean, contemporary design, with a keen eye toward blurring the boundaries between the indoors and outdoors. The clients of our Costa Rica architectural firm come from all over the world including Germany, Austria, Switzerland, UK, Australia, Canada, Dubai and the United States. They have widely diverse desires but share one common desire: to own a modern, luxury vacation home or investment property in a beautiful, tropical location like Costa Rica. We know we’re not the only architects in Costa Rica, but we are the most advanced. Most local firms still use 2-D CAD drawings and blueprints, which is outdated, inferior technology. For the past 10 years (We were the first in Costa Rica!) we’ve been using Building Information Modeling (BIM), 3-D modeling software. And we use it exclusively, something other firms can’t say. BIM allows us to build our designs virtually and include the finest degree of detail. While other local firms may claim they use 3-D modeling, most are new to the technology and use it only in limited applications such as the initial stages of a project and not for their final drawings. SARCO Architects has received national recognition as Costa Rica’s most progressive architectural firm in the application of BIM technology to high-end luxury homes. Graphisoft, publisher of the industry’s 3-D modeling programs, has publicly praised SARCO’s use of the software. “From the beginning until today, SARCO Architects has set a worldwide example of how to apply 3-D technology to design and construction processes. The firm is an outstanding representative of best practices with ARCHICAD. With SARCO Architects, you won’t have to interpret blueprints to visualize your home’s design. Our 3-D designs allow you to see precisely how its features will look when built. The models are transparent and extremely detailed, revealing everything from the views out the front window to the texture of the tile in your shower, from the physical configuration of the structure to the “guts” that make your home work. Aesthetically and functionally, the features must come together into a cohesive design that can be scrutinized, harmonized and used as a plan for execution. Because 3-D models are so precise, they minimize the possibility of mistakes, delays and cost overruns. The entire project typically moves along more quickly and smoothly when everyone involved – client, builder, materials procurer, interior designer, landscaper, etc. – can clearly see every specification. What’s especially convenient for our clients is that you can look at the architectural designs remotely. View them on your home PC, tablet or Smartphone. Now you don’t have to travel to Costa Rica to make design decisions. We leverage technology to make project management efficient. Using web-based and mobile applications, we’re able to be in touch with you anytime and from anywhere. Every aspect of your home’s architecture has a designated place online where it can be discussed with team members and referenced as needed in the future. All information is documented, leaving no room for miscommunication or unanswered questions. As a property’s features are refined and design decisions made, the details are added to the 3-D models and also noted in the project management software. Everyone working on the project sees the updates, which facilitates communication and efficiency. Communication is also easy through our customized project management applications. We invite you to be involved and active in the process, which ensures positive progress and a successful outcome. SARCO Architects brings specialized expertise to high-end custom luxury homes. Many of our projects have been located in the Peninsula Papagayo Luxury Resort, Costa Rica’s premier resort property destination. In fact, we are Costa Rica’s only firm with 10 years of non-stop work in homes in Peninsula Papagayo. We have the most designed and built residences for private homeowners in this upscale resort. We’ve won numerous architectural design awards including highly coveted international Property Awards, which are among the industry’s most prestigious design competitions. Three of our projects have received awards at this venue, a distinction no other architectural firm in Costa Rica can claim. However, we never design projects for awards. We design homes for people, and their desires and vision are what matter most to us. If you’re considering a custom-built home or investment property in Costa Rica, Panama or the Caribbean, let us explain our architectural design process and answer your questions. Contact us at SARCO Architects. 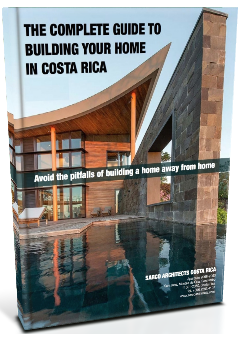 We offer you our FREE “The Complete Guide to Building your Home in Costa Rica”, a 2-part document with many of the essential elements that you need to know about when considering building your own home in paradise. CLICK HERE to Visit our Free Guide page for more information.